Voyo VMac Mini, also sometimes referred to just Voyo V1, is an actively cooled mini PC powered by Intel Celeron N3450 or Pentium N4200 Apollo Lake processor. I’ve received samples for both, and already taken pictures of the device and motherboard. So in the second part I’ll review the mini PC checking out system info, running some benchmarks on both, and see how it performs as an entry-level desktop PC. 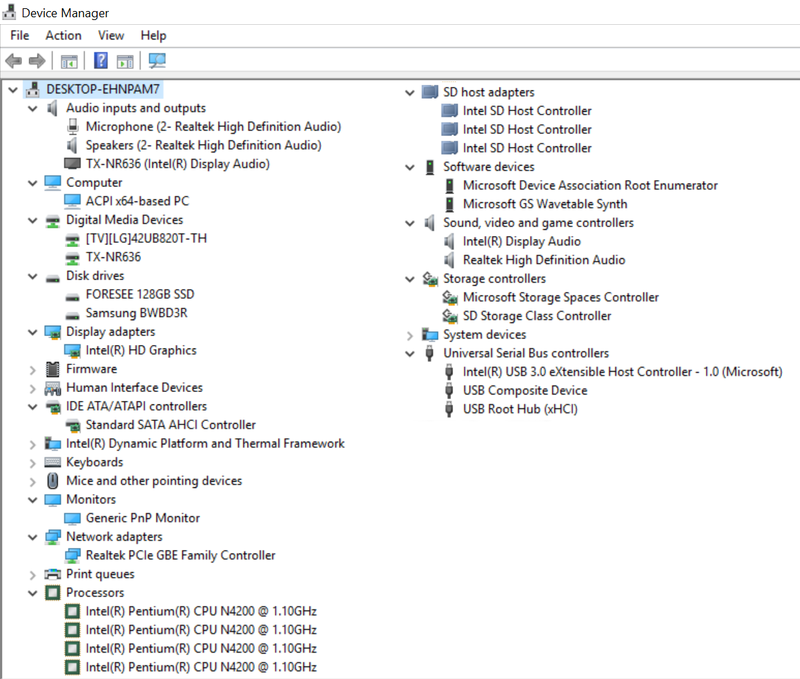 Setup is pretty straightforward, as you just need to connect mouse and keyboard, Ethernet, the mini HDMI to HDMI cable, optionally the included USB WiFi dongle, the power supply, and finally press the power button to get to Windows 10 desktop logged in as “admin” user in about 30 seconds. Some Apollo Lake mini PCs support HDMI 2.0 video output, but this requires a DisplayPort to HDMI 2.0 bridge chip, which not included in Voyo VMac Mini’s board, so the system supports 1080p resolution up to 60Hz, and 3840×2160 up to 30Hz. 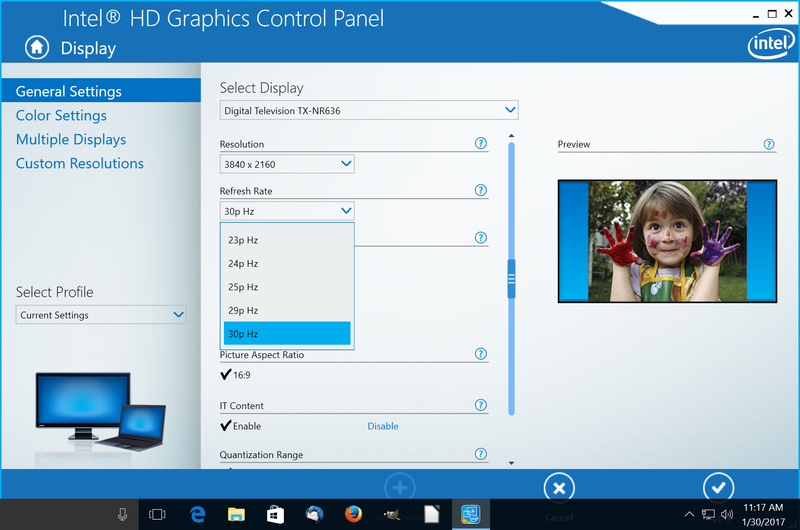 4K video output will work, but by default the system will be set to 1080p60. Window will show a “non-optimal resolution” notification on the bottom right whenever you change resolution to 4K. The System Info window will show the device is running an activated version of Windows 10 Home 64-bit, and comes with 4.00GB (3.84GB usable) RAM and Intel Pentium CPU N4200 @ 1.10 GHz (or Celeron CPU N3450). 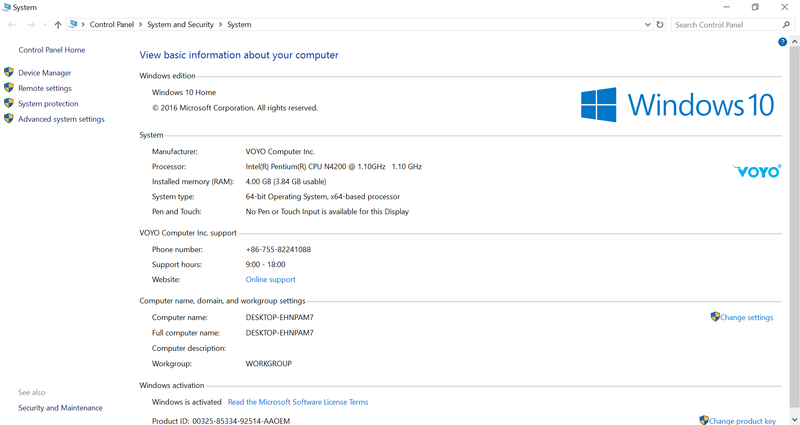 However, Voyo may not be 100% in compliance with the hardware requirements for a discounted Microsoft license, as while it comes with 4GB RAM, and a 32GB eMMC flash, Windows is installed on the 128GB SSD instead. I’ve also included a “Device Manager” screenshot for a bit more info about the peripherals and features. 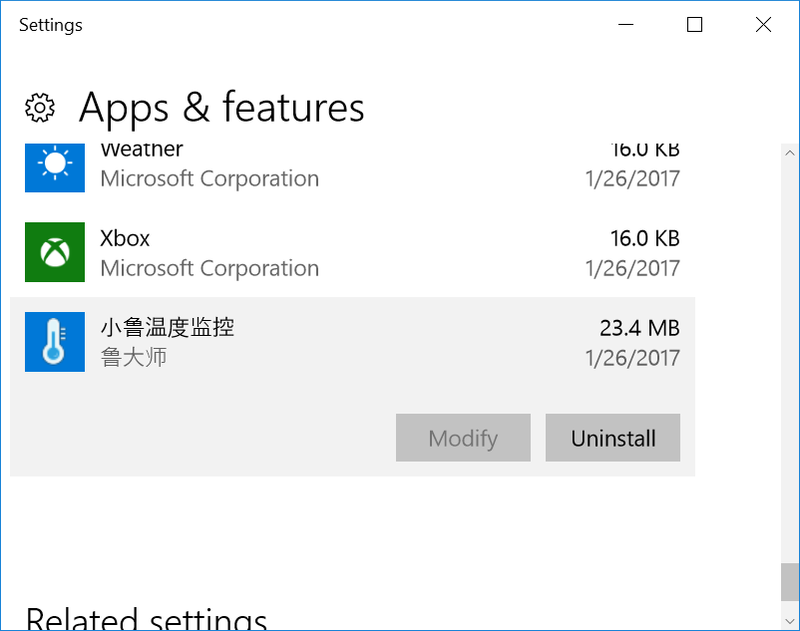 One of the first thing you may want to do is to remove some Chinese programs which are running in the background. The two processes are called ldslite.exe and computerZservice.exe, and many websites report about those two from the ones saying they are safe, to the ones claiming they are adware, to the ones claiming both are very dangerous viruses, and you need to download their free software to remove them. 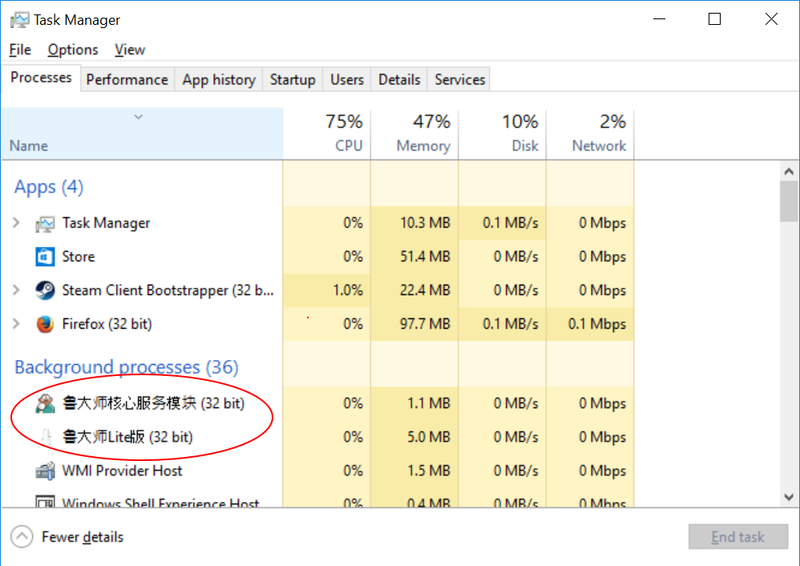 I have not seen any ads, but I could remove both easily simply going to “Add or remove programs”, and removed the only program with a Chinese name which removed both processes. If you are interested in typical system benchmarks I’ve already reported about PCMark 8 , Passmark 8 & 9, and 3DMark results in the posts entitled “Voyo VMac Mini mini PC (Intel Pentium N4200) Benchmarks” and “Voyo VMac Mini mini PC Benchmarks with Intel Celeron N3450 Apollo Lake Processor“, so I’ll just add storage and networking benchmarks in this section. 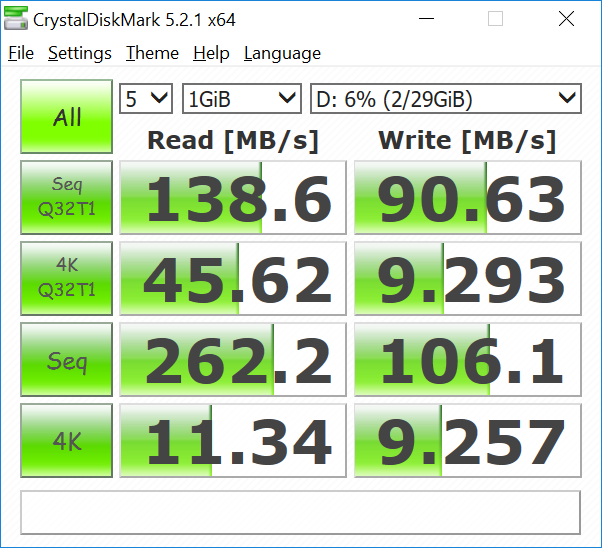 The C: drive is the 128GB FORESEE SSD drive where Windows is installed, and both sequential and random performance is pretty good, and ever faster than the already pretty fast SSD found on Voyo V3 mini PC. The 32GB eMMC flash (D: drive) is not quite as good, and from a technical point of view, it was the right thing to do to install Windows on the SSD. Voyo VMac Mini does not include a wireless adapter internally, but a 802.11n WiFi dongle is included. Since you may want to use your own instead, I have not tested WiFi, but only Gigabit Ethernet using iperf 2 for a 60 seconds full duplex transfer. The good news is that such machine can now perfectly be used a an entry level computer for multi-tasking such as reading email, browsing the web, and editing documents. 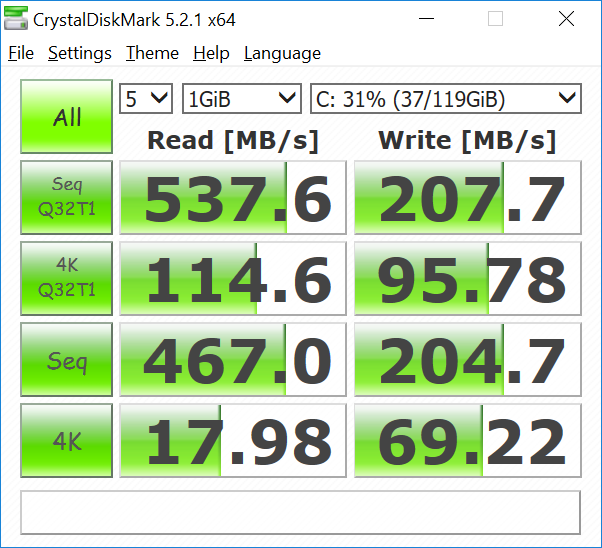 Beside the incrementally faster processor over Braswell and Cherry Trail systems, the fast SSD and 4GB of RAM clearly help here. You’ll still see differences with faster machine while scrolling long web pages, and playing games. 4K YouTube videos are playing well in Microsoft Edge, and not too bad in Firefox with only a few frames dropped here and there. Asphalt 8 frame rate does really feel similar to what I experience in Atom x7-Z8700 or Celeron N3150 based mini PCs such as Beelink BT7 and MINIX NGC1. Kodi 17 is almost out, so I used Kodi 17 RC3 during testing, with automatic frame rate switching working well, for example a 4K @ 30 fps video will make the resolution switch from 1080p60 to 4K30 automatically, and H.264 and 10-bit H.265 videos are playing fairly well. VP9 videos however are extremely choppy and unwatchable in Kodi 17. If you have a lot of animes using 10-bit H.264 (Hi10p), th goods news is that the processor is fast enough to play such videos using software decoding. HDMI audio pass-through works for Dolby Digital 5.1 and DTS 5.1, but not for TrueHD instead playing PCM 2.0 or transcoding to Dolby Digital, and DTS HD with the platform only passing DTS 5.1. Some mini PCs do no handle heavy loads very well, with CPU throttling occurring after a few minutes, even for devices with a fan. 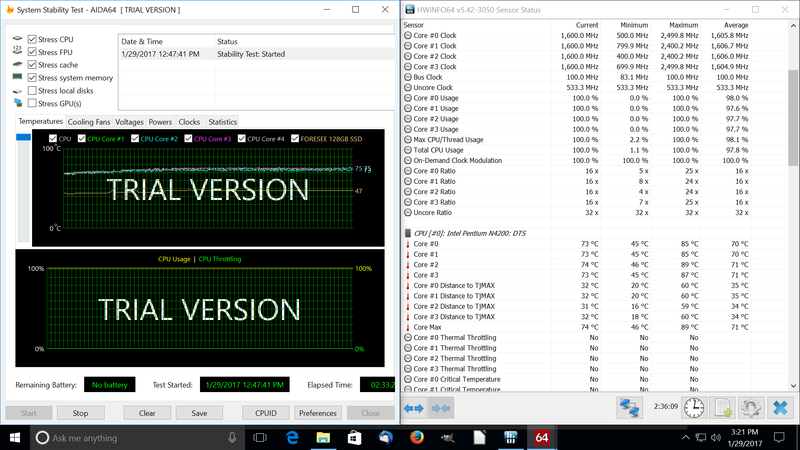 So I ran AIDA64 Extreme Stability Test to find out, as well as HWiNFO64 in sensor-only mode for a little over 2 hours to find out. The results are very good with no CPU throttling, the maximum temperature achieved was 89 °C, 16° C from the maximum Junction temperature (105 °C), and the Pentium N4200 processor was clocked at 1.6 GHz most of the time right between the 1.1 GHz “baseline” frequency and 2.5 GHz maximum burst frequency. The system is not fanless, but the fan does not allow turn, as it depends on actual temperature, and the higher the temperature the faster the fan spins. GM1352 sound level meter placed at about 2 cm from the top of the case reported 50 dbA under light load, and either 52.5 dBA during AIDA64 stress test, with burst up to 57.5 dBA during the same test, that would only last maybe 10 seconds. Fan noise is not too bad while browsing the web, although audible, but for any demanding tasks you’ll clearly hear it on the temperature rise enough. Power consumption was 10.3 Watts without USB hard drive during the stress test, but there’s a design flaw in power off mode as USB ports still draw current, so with a USB 3.0 hard drive connected, power consumption is 2.0 Watts when the device is turned off, and around 1.0 Watts when I only leave the USB keyboard and mouse. 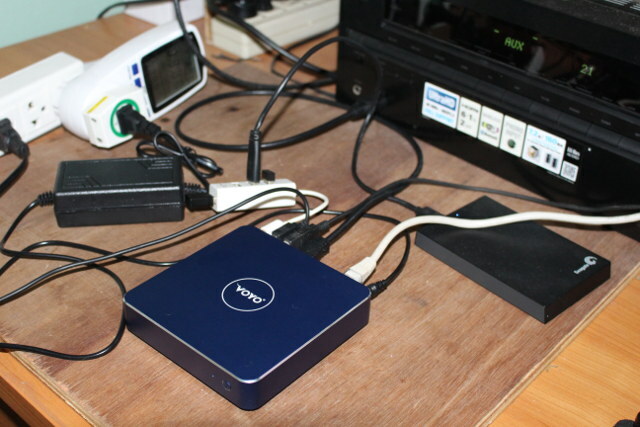 Idle power consumption is 6.4 to 7 watts with USB HDD connected. Voyo VMac Mini works as advertised, and performance is quite good with the Apollo Lake processor processor, fast SSD storage and 4GB RAM. I could perfectly see people using it as an entry level computer to browse the web, work with documents and spreadsheets and so on. People who want to run high load on the device should not worry about CPU throttling as the fan and heatsink take care of cooling the device even under stress. It’s obviously still limited when it comes to games, and it might not be the best price/performance for HTPC use, as while 4K H.264 and 10-bit H.265 videos can play, 4K output is limited to 30 Hz (HDMI 1.4), 4K VP9 is not working well in Kodi, and HDMI audio pass through is limited to Dolby and DTS 5.1, and does not support Dolby TrueHD nor DTS HD formats. At the beginning I also had some issues with some USB flash drives (NTFS) recognized by the system, but not mounted (no file system detected), but the problem went away, maybe after a Windows 10 update, and I could not reproduce the issue anymore at the end of the review with any of the 3 drives I tested. Please note the mini PC does not include WiFi, nor Bluetooth, but a WiFi dongle is included in the package instead. There was also some crapware installed in Windows 10, but as indicated in the review it’s very easy to remove. I plan to test Linux with Ubuntu 16.04, but so far my attempts have not been successful. The BIOS find the bootable drive with Ubuntu, but when I select it, all I get is a black screen. I’d like to thank GearBest & GeekBuying for providing the samples for review, with the former providing the Pentium N4200 version which they sell for $234.93 and the latter the Celeron N3450 version selling for $199.99. Both models can also be found on other online shops such as Amazon US and Aliexpress. Note that the version on Aliexpress is significantly cheaper because it only comes with a 64GB SSD. The custom SATA cable to add your own 2.5″ hard drive is only $2 extra if you select a bundle on the Aliexpress link. ldslite and computerZservice are part of “LuDaShi” aka Master Lu. According to Google Translate It seems to be some sort of thermal control service. You might not want to remove it. I am changing my unopened Beelink BT7 for either version if someone is up to? I bought one of these to run Linux, and I also found it very difficult to install. After a week of trying, I finally got it to work. Linux USB sticks won’t boot because the GRUB boot loader doesn’t like the EFI system on the Voyo. You made a newer post about LibreElec working on the Voyo, and that gave me an idea. LibreElec uses Syslinux to boot from the USB rather than GRUB, and that’s why it works. I made an Ubuntu USB stick and a LibreElec USB stick using Rufus on Windows. Then I deleted everything in the /EFI folder from the Ubuntu USB stick, and copied the /EFI/ldlinux64.efi and /EFI/syslinux.cfg files from the LibreElec stick and put them on the Ubuntu stick. Then I edited the syslinux.cfg file on the Ubuntu stick and pointed it to the correct Linux kernel and initramfs. After doing this, I was able to boot from the Ubuntu USB stick and install Ubuntu on the Voyo. But obviously Ubuntu installed GRUB to boot the installed system, so I had to make a few changes from the live USB environment before I could boot into the installed Ubuntu. From the live USB environment, I chrooted into the installed system (after mounting /sys and /dev properly) and uninstalled GRUB. Then, I installed the Refind boot manager, which placed its files on the FAT32 EFI partition. The modern Linux kernel has its own EFI loading stub, so Refind can boot directly from the kernel image. Unfortunately, Refind can only boot from kernel images that are on the EFI partition, so I had to copy the kernel and initramfs file onto the EFI partition. Then I was able to reboot the machine. When Refind launched, it detected the kernel file. All I had to do was change the boot parameters to root=/dev/sda2 and I was able to boot my installed Ubuntu. Refind should remember the boot parameters and automatically use them in the future, but I edited the Refind config file to permanently add my kernel image and its boot options. If GRUB ever gets updated to fix whatever is causing the ‘panic on boot’, this process will be unnecessary. But for now, this is how I got Ubuntu to run on the Voyo Vmac. This process isn’t foolproof, because if a system update ever installs a new Linux kernel, I’ll need to re-copy the kernel image and initramfs file to the EFI partition. But for now, everything works. May i ask how to point to the correct linux kernel and initramfs based on LibreELEC stick’s syslinux.cfg ? I could explain your method better because I can not install Ubuntu on Voyo V1.